With two faces he looks forward and back. 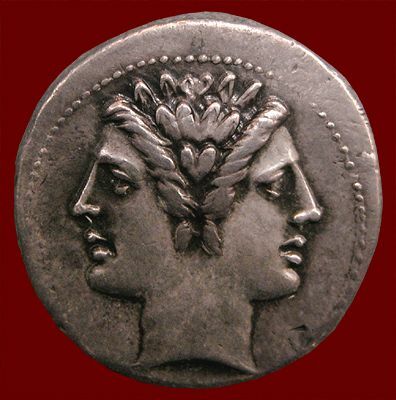 We are big into gods here in Greece but it is the Roman’s god Janus that I believe is the god of ex pats everywhere. The ex pat lifestyle requires a good hard look back and then one serious look forward when making the leap from one world to the next. Being an ex pat requires endings to make way for beginnings. I’m the early riser so starting a fire was my job on a deep and dark December morning a week ago. Our Stone House on the Hill was cold. The fire built the night before by The Scout had gone out. With my left hand aiming our trusty flashlight (or torch, as my British friends would say) I was sitting in front of the fireplace trying to restart a fire. I was being reminded why when even in the best of circumstances, I am not the regular ‘fire starter’ in this household. Back in our 'other life', I’d have gone on autopilot, turned a button, and the gas fireplace would have lit instantaneously. Why was it we wanted to move here anyway?!?!? Those of you've who've 'been with us' this year know the answer to that question as I’ve been waxing poetic about it for months. If 2018 goes as planned, it will go into the record books as our first year as full-time residents living on the edge of an olive grove in the Kalamata area of the Greek Peloponnese. So with the heat back on and lights on I am a much happier gal, but still thinking about the question I snarled to myself the other morning. Perhaps the short answer to the question is that we wanted to turn off the ‘auto-pilot’. We were in a pattern of living that required little thinking and participation; we'd lived that life so long we did it on autopilot. Televisions operated by remote control, machines dried the clothes and washed the dishes at the push of a button, gardens were tended by hired help and groceries could ordered on-line and be delivered to our door. While it is hard to determine an exact number of ex pats, in 2016 the U.S. State Department estimated there are 9 million of us out in the world exploring new roads and crossing new bridges. That’s about the population of New Jersey and about two million people more than the populous of Washington State. There must be some reason for that many to be scattered about the world. Admittedly many are working outside the U.S. but others of us are boomers, enjoying retirement years in a different world from that which we knew. . .
What drives a desire to be an ex pat? I continued my research and found boomers' reasons for choosing to be ex pats are as varied as the statistics about us. Ex pat, by the way, comes from the Latin words: ‘ex’ – out of; ‘patria’ - country. Days spent in the sun - I’ll have to admit that more sunshine and a warmer climate helped draw us to Greece (even if we do have severe wind and rain storms a few times a year). Seattle claims 152 days of sunshine and Kalamata 219 such days. Medical costs are cheaper – In our case we have found that our medical insurance coverage (which is required to obtain a residency visa here) costs about $560 US a month and it covers us for six-months each year in the U.S. as well as anywhere in the world. We were paying just over $700 a month in the U.S. with only limited coverage outside the U.S.
Cost-of-living is cheaper/financial rewards – Those ex pats in our area from the U.S. generally agree that food and entertainment (dinner and drinks out) are much cheaper than back home. We were surprised to talk with some ex pats from Britain and Germany who felt the prices here were much higher than their 'back home'. It is all in your perspective, we concluded. We can have a lovely meal, in a nice restaurant with a sea-view and drink all the wine we can safely consume and drive home, while paying about $25 U.S. Gasoline, on the other hand, costs about $7 a gallon and most of us ex pats in the area do a lot of driving because we want to explore our surroundings so fuel costs are definitely higher for us. We pay a road tax annually (as opposed to Washington State where it was tacked on to the per-gallon-cost) and our tax was 433 euros or about $525 US for 2018. Cost of insuring the car was about the same here and there. Internet and phone costs are where we are seeing a real savings. Our landline, mobile phone and internet cost us more than $200 a month in the States (even the months we weren’t there to use it). Our internet is 100 euros ($120) a year and we’ve spent about 70 euros ($84) on our cell phone (data, text and talk) minutes in the last three months. A base for more travel – One of the reasons we wanted to have a home-base in Greece was for quicker and easier travel to European and Middle Eastern destinations. Many boomers are travelers but those long-haul flights of 10+ hours can do in a young person let alone people our ages. Living on this side of the Atlantic we can visit any major European city in a couple of hours flight time (and for a lot less than setting forth from Seattle). And one of the reasons that struck a real chord with us was, ‘fear of a life unlived’. When it comes right down to it, I bet that is why most boomers have chosen the ex pat life. The life of an ex pat can be frustrating some days – like those without heat and lights - but far more days are filled with rewarding experiences than challenges. We’ve turned off the automatic pilot and are required to fully engage in life: mental, physical and emotional. We've heard those same sentiments expressed by fellow ex pats here and elsewhere on this side of the Atlantic. Many of you have said that you’d like to be an ex pat. We’d loved to hear what country is calling out to you and why you want to live there. Others of you shudder at the thought. We’d love to hear your thoughts as well on why this different lifestyle doesn't appeal, so leave us a comment below or shoot us an email. And before we sign off this week, I do have to thank the creators of Getting On Travel, an on-line luxury travel publication aimed at the boomer traveler for including TravelnWrite in its list of Top Blogs to Read in 2018! On that note, thanks again for your time and interest and Happy New Year wishes to you and yours. May it be happy and healthy and filled with travel (armchair or real)!! Thanks for all the detailed info and for telling it like it is. I'm glad you now have a challenge and that you're up to it. I guess I'm glad I made my move out of America when I was only 22, before I got attached to anyone or any thing. And thanks for being such a 'cheerleader' and good friend this last year, Dina. Amazing to me how many of my social media friends know me better than do those long-time friends I left behind in America. Happy New Year, may our paths cross one day in real life! Right, me too. "Some of my best friends" I've never met in person and don't even know the sound of their voice. Well it would have been a bit nicer had we not been in the dark and cold when I was trying to recall those Girl Scout skills, but the warmth (both physical and emotional) just can't be beat. Happy New Year! Jackie, thanks so much for this. I loved the metaphor of starting the fire for diving in to the expat life. While we travel almost full time, we haven't left the US for more than six months at a time for a long time. We talk of it often, and will do it one day. But, I have to admit that being permanently away from the grandkid would be very, very hard. All the best to you. Thanks for the linkup! Always a pleasure to participate! There are always going to be pros and cons of living anywhere, even in the most idyllic place on the planet, but at the end of the day, it's how one feels, both physically and psychologically, that matters, isn't it? So, when I see those happy smiles on both you and the Scout, it is very clear that your Stone House on the Hill, balances everything out beautifully. The last few weeks have tested our resilience that is for sure. But we've had some good days along the way and I am certain spring isn't far away now. . .and thankfully the days are getting longer!! Thanks for stopping by Irene! Happy New Year and Happy Travels to you. Interesting insights into why ex-pats choose the life they do. I can definitely relate to some of them, although being in Canada, our medical costs are not a big issue. Have fun in 2018 and work on those fire-starting skills! Thanks Jane and Happy New Year to you! I do have several skill-sets (including fire starting) that need some polishing in the coming year! You seem so happy with your choice of living in Greece. I admire your courage in stepping out of the box. I am far too much a scardy cat to ever do anything like this. Have fun, enjoy ea day and be sure to treasure ea day with your sweetie. We generally are pleased with our 'leap into the unknown' but the winter weather has kept us cooped up indoors for far too long. . .we need some sun and exercise to brighten up our attitudes! (It will happen, I am sure!) Happy New Year BJ - may it be filled with "Sweet" memories. . .
We always knew we wanted to travel even though somehow we got caught up with the house and white fence and work life. Life has definitely slowed down a lot and we chose to move to Europe so we could have shorter flights plus it is closer to his home and mine as well. Sounds like you're enjoying life in Greece. We are based in Valencia now after some time in other places including Malta. Happy New Year! First, congrats on your "Top 10" listing! It's easy to see why you would receive that honor! I don't know that I'd ever really be an expat, but who knows? I do love the idea of it, mostly for the ease of travel to other countries, and, as you said, that fear of a life unlived. The property tax point compelling, since ours are sky-high in NJ, and now, we won't be able to write them off on our taxes anymore. I'd consider Italy, for the food alone, although Greek pastries are my absolute favorite, so perhaps Greece? :) I'm open! Well it wasn't quite a top 10 but I'll take any recognition I can get! Good to hear from you and Happy New Year (Kali Chronia) from Greece! I really admire you. You're right; it wouldn't be for the faint of heart. I understand you wanting to closer to many destinations. Flights can be very exhausting. I wish you lots of good fortune in the New Year. I look forward to reading more about your adventures. Thanks Marilyn and Happy New Year to you as well. Hope yours is filled with adventures and travels. Love your road home and fireplace in the stone house on the hill. I'm looking forward to reading about your expat life in Greece and travels around Europe and the Middle East. Ha, and here I am headed back to the States! (Timeshare time in Hawaii. . .) but I'll get those other travels fit in for sure! Sunny Hawaii?! That should cure any suspected SAD (Seasonal Affective Disorder). :) Have fun! Sounds like there are many pluses to the ex-pat life. As much as a cottage on the edge of an olive grove in Greece, or Italy, or Spain, sounds wonderful (and I am envious), I know it will remain just in my dreams. But at least I can delve into your life right here! Your pic following the cart put my in mind of Gerald Durrel and his books about Corfu. Wishing you a safe and very happy 2018 in Greece and whereever else it takes you! Jill the same good wishes from me to you for a Happy, Safe and Healthy New Year filled with adventures galore! Happy New Year. I Loved your post. I am already an ex pat from India living in NZ. When I retire I would like to spend a few years in Spain or Italy. Why? I have no idea - perhaps just to experience a different culture. Dropping by from WW. I'm glad I found your blog. Hi Suzy, So fun to hear from you. Do keep in touch and add your thoughts on being an ex pat -- I love 'meeting' folks like you! Please come back again!! Your post perfectly summed up all of my feelings about being an expat Jackie! The phrase, "turn off the auto pilot" certainly resonates with me and it's the perfect way to sum up being in the here and now where every day can bring a new appreciation for small luxuries that we used to take for granted. Making a new home in a foreign country might not be for everyone but, to paraphrase Rick Goodwin's quote, we have no doubts that we've gained far more than we gave up. Happy 2018, Jackie and Joel! That 'turn off the autopilot' may be my mantra for the year. And in looking back I do think life has been richer for the change even though it might be more difficult at times! Ruth thanks so much for this lovely comment. I really do try to put a spin on these tales that get the reader (and blogosphere friends) to pause and think about life and how our experiences are much like theirs, just packaged a bit differently. Thanks again for the thoughtful comment! You will never believe where I found you! My husband and I are staying in the Ingrid Bergman Suite in Hotel Nevada tonight. I picked up the room register book and found your beautiful handwriting that caught my eye. I read the short note, found the blog site you had written and here I am! Ironically, my husband and I are seriously thinking about ex-pat life out of Utah, but may move to Nevada first. I was impressed with your writing, your courage and your site! Looking forward to following you! Oh Naebelle, I wrote you an email which I hope you've received but if you didn't -- Welcome!! So glad you found us and hope you'll continue to follow our adventures. Please do comment often. That's what makes life so interesting! How Sweet that Taste of Tripoli! Heading to the Other 'Home' ~ Make that, 'Hale'! Then came Saturday morning and . . .